Weighing enough to read or keep paddling? 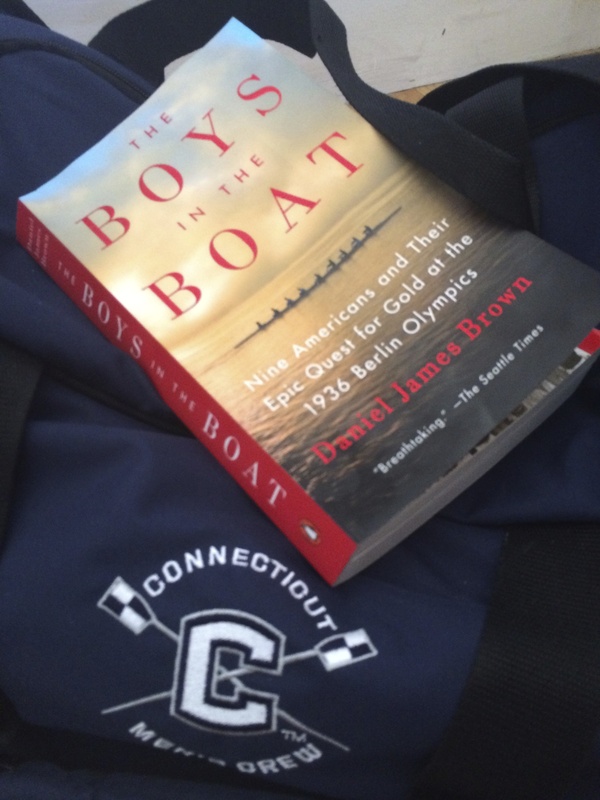 When Daniel James Brown’s The Boys in the Boat first came out last year, my coach Paul Bloom at UConn wanted us all to read it. I knew I would eventually, and when it came out in paperback I got a copy to mark up the good parts to keep in my duffle. But it wasn’t that kind of book. I wouldn’t find a new, inspirational way to call for a power ten for the boys in my boat to pull harder and tap into some drive that even they didn’t know they still had. These boys hailing from the University of Washington were the other Huskies, the ones who won the gold medal at the 1936 Olympics right in front of Hitler. I’ve held an Olympic gold medal once for an unforgettable brief moment. It feels cold, hard and solid, heavy in a fulfilling and complete way. Just being in the presence of gold and an Olympian is inspiring. To win one must be divine. But Brown’s book isn’t about winning a race but to survive past the opposition. Brown offers a lot of rowing knowledge, history and technique throughout his nonfiction narrative. Through impeccable pacing and detail Brown really connects to the essence of what it feels like to be a rower. There is a pulse to the story as Brown captures the rhythm and language of rowing and writes from the heart. The narrative is framed on third seat rower Joe Rantz, from his sad but resilient childhood to the dying man in his nineties who wanted this story to be “Not just about me. It had to be about the boat.” Brown does tell the story of the boat, but makes the story personal using Joe Rantz’s life set against the Depression, the Dust Bowl, Hitler’s militarization of Germany, and the propaganda of German cinema. The coordinated effort of event and circumstance is amazing to read but just part of the story. There is also the ongoing rowing rivalry between University of California, Berkeley and UW, especially by the coaches. Brown gives a lot of insight to UW’s winning record through Varsity Coach Al Ulbrickson, UW Novice Coach Thomas Bolles, and Cal Berkeley Varsity Coach Ky Ebright who had coxed for UW. My favorite personality was Brit George Yeoman Pocock who built cedar racing shells for most of the collegiate crew teams in the country on the second floor of the UW boathouse. Pocock was a self-taught rower who adapted the short quick stroke, a quick catch and a quick release from watching watermen ferrying passengers on the Thames. Brown uses a spot on quotation from Pocock to start every chapter ironic as the proper Brit never offered unsolicited advice. But Pocock was always called upon going back to the boys at Eton, the East Coast Ivies, Wisconsin and a pesky Ky Ebright. These boys on the water were heroes. These boys on the water had skill, drive and swing as they feathered in unison with that swoosh of power that every rower instinctually feels deep in their core. There is no doubt that every rower wants to win, but the 1936 Olympic team hailing from UW had the humility, the intelligence and the will to survive. What Brown has done here was to hand humanity a how to book to row faster, stronger, and further beyond our blisters, egos and time trials but also how to row faster, stronger and further beyond the Depression, the Dust Bowl, abandonment and hunger. 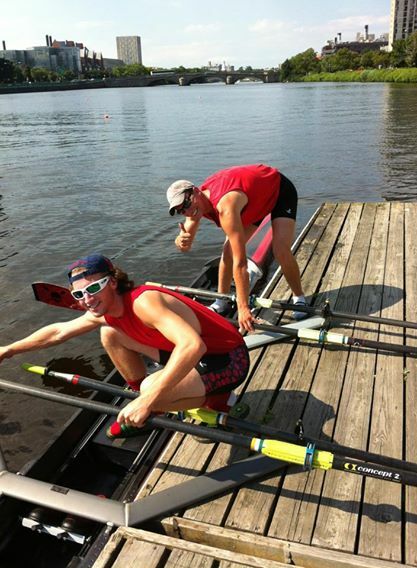 These boys rowed because they all mattered. They did whatever they could to move forward in tough times. They were tough because they had to be. They found power in each other and each stroke because they put heart, body and mind in the boat. Mind in boat was their mantra as it should be, but for these boys it was religion. My rating for The Boys in the Boat is five oars because it is the most I can give any book. I’m stowing my marked up copy in my duffle for inspiration and to be reminded of the potential we all share. The Boys in the Boat offers an exhilarating way to slip away from all of life’s trepidations for the reader just as it did for these boys as they pulled water. No rowing experience necessary. Sitting Ready! Attention Row! The Boat Master’s words alerted John’s ears as he catapulted off the catch to take his first stroke during the last regatta of spring season. John couldn’t help but think his crew didn’t stand a chance of moving on to Grand Finals. The boat raced down the course. John’s boat neared the last five hundred meters trailing behind with poor technique and little power. The boat never recovered and finished last. Rowing is a sport where fractions of a second usually separate first from last place. John could not help but be disappointed in his boat finishing a full minute behind every other boat in the heat. As stroke of the eight it was John’s responsibility to lead the boat to victory. The team slowly carried the boat back to the trailer in silence. John walked with his head hung low and vowed to himself that his boat would never be ill prepared for a race again. Spring season is now in the past. UConn’s boathouse is closed up and waiting for the approaching fall season. John could blame UConn’s poor performance on the lack of funding to acquire better equipment, the coach’s lack of experience or the last minute changes made to the lineup due to teammates quitting. These are all valid contributions. But John admits that both his and the team’s overall power and technique were lacking behind each pull of the oar. John regrets not taking winter training seriously. 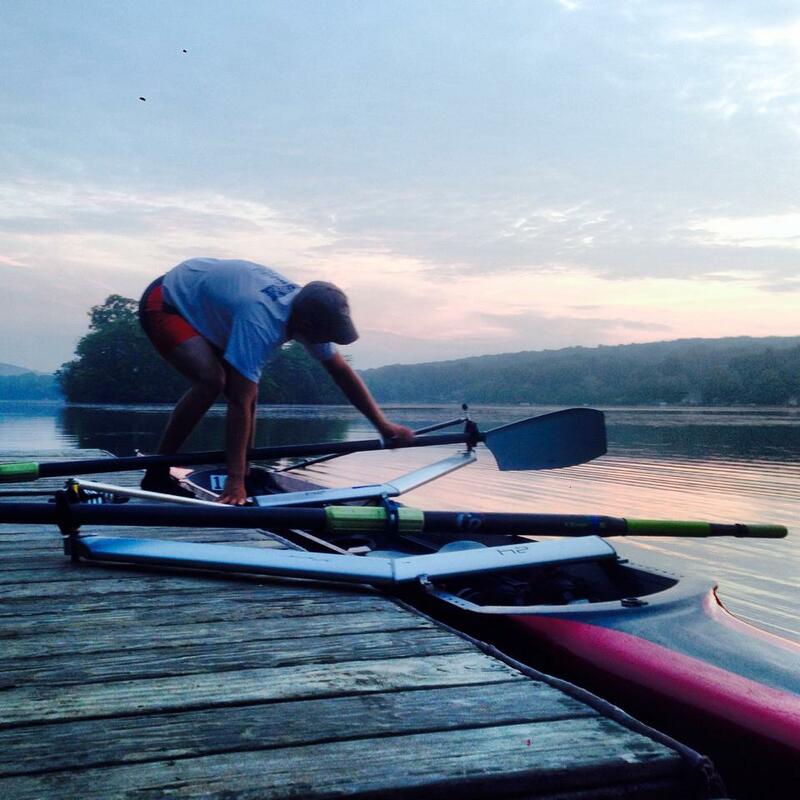 Summer training has begun but instead of repeating past mistakes, John wakes up with the drive and determination to improve as a rower. John starts everyday the same way, already dressed having slept in his spandex. Up at 4:30, out the door 4:45, on Rogers Lake in Old Lyme CT by 5:10. Jacob a rower from Drexel is John’s rowing buddy. The two take out a nameless faded red Hudson double that they have nicknamed “Huddy”. The practice consists of a warm up on water by doing a lap around the L shaped lake. Then a progression drill: arms only, arms and back, half slide, full slide. Depending on the day, they switch off from a low rate steady state and high rate sprint pieces. 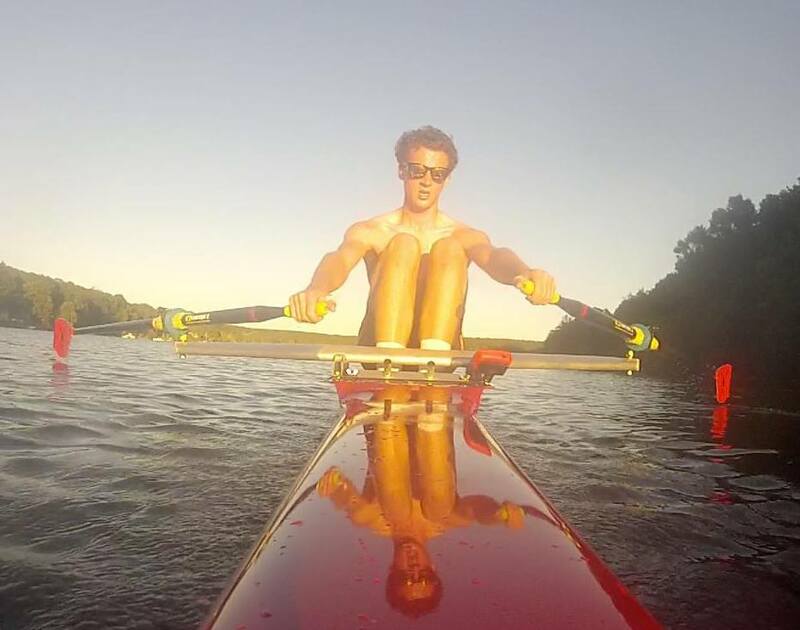 John believes consistency is the key to rowing. Having the same boat everyday rigged to his height and weight and the same lineup has made all the difference. John is no longer distracted from adjusting to changes and focuses solely on technique. Rowing in a double helps John feel the boat’s reaction to his stroke. This is something he could never isolate in an eight at UConn. He finds using a speed coach helpful to make up for not having a coxswain or coach to know the strokes per minute and stroke rating. This keeps John in check to get the most out of each stroke and keeps him from slacking off and developing bad habits. John attaches a GOPRO to the boat, which records every row. At night John reviews the footage noting where to make changes. The change John is currently focusing on is a crisp finish having a sharp tap down, to pop the blade out of the water keeping the momentum of the boat propelling forward. By seven John is at work but not before his reward of sausage, egg and cheese on a bagel with a medium iced caramel coffee. John laughs that sometimes when he wants to end a row early, he thinks of this treat from Dunkin and he pushes through. John wishes he had the time and energy for strength training. For now, the heavy lifting on his job will have to do. John is majoring in Landscape Architecture. So, he fits his summer rowing into his summer schedule of cutting lawns and landscape design. Being in the hot sun all day is exhausting enough. Add planting, weeding, pruning, trimming, etc., and you’ve got cross endurance training. John hopes to add more weight lifting and erg workouts as the summer season progresses. This is something that John has always shied away from, an important routine that will make a powerful difference in his water performance. John’s summer routine is to get out on the water every day. He plans to row for two hours followed by backbreaking work. He consistently works to get faster and stronger. John is now developing a winner’s attitude towards a sport he has engaged in for six years. John is no longer a participant but a competitor. He now looks at rowing as a way to relieve stress and be a part of something greater than oneself. Like a cog in a machine, John is getting lost in the rhythm of each stroke. Determining his goal ahead of time gives John the ability to change. It took the embarrassment of losing for John to realize his potential. No longer does he hit the snooze on his alarm. And no longer does he give up when the pain sets in. His new motto is “Medals are not earned during races they are earned during practice.” John is dedicated in making every day over the summer count. With this new found determination John now sees fall season as a waiting opportunity to push his limits and take gold. Everyone knows Aesop’s fable of the Tortoise and the Hare. The hare boasts of his jackrabbit speed, agility and athletic physique to a crowd of animals in the forest. The shorter tortoise is among the crowd listening from below. He is always prepared as he always carries a place to sleep or hide when trouble is afoot. But the hare is too quick, eyeing the tortoise as an easy competitor and taunts the more sluggish tortoise into agreeing to race. The hare as one might expect has a fast start, almost immediately out of vision before the tortoise barely crosses the start line. The arrogant hare stops to nap confident in his superiority to the short-legged tortoise weighed down by his heavy hard shell. But while the hare snoozes, he also loses to the tortoise who slowly, steadily passes the hare by to win the race. The moral of the story is that slow and steady wins the race. But what about before the race? What did the tortoise and hare eat for breakfast? The tortoise was slow so maybe he had a big breakfast of flies, or some other insect. Maybe the tortoise absconded some soft-shelled eggs from Chicken Little. But one thing is for sure the tortoise ate protein. Maybe the tortoise carried his shell because he snacked along the way. Maybe he always carried his shell because he always ate small meals throughout the day. In contrast, the hare may have eaten some hay and oats. More than likely the hare ate some carrots, both the tops and the bottoms. Maybe some bok choy or cilantro. But even though carrots are good for one’s vision, the hare never saw the tortoise coming. And while colorful and full of good stuff like vitamin C and beta-carotene, the sudden sugar rush gave the rabbit the energy to get his head start. As complex and as crafty as hares are known to be, his diet of carbohydrates, especially his carrots, caused the hare to peak and crash, so he took his famous nap. It’s simple really when one thinks about it. The hare’s diet of too many carbohydrates, complex carbohydrates without added fat made him snooze to eventually lose. If the hare had added some fat, just a little olive oil he would not only have had a really nice salad, but would of lasted longer because carbohydrates need fat to bind them. This would slow down the process of absorption. The hare would not have crashed so quickly in the race and needed to nap. Ironically the hare should have known better as he and his rabbit kin are essentially a higher source of protein with less cholesterol than chicken, pork or beef. Then again, maybe the tortoise had his own reasons to keep moving. The tortoise has always been in demand as a delicacy in many parts of the world and places like Malaysia have imposed harvesting quotas on turtle eggs. Like most of us, I can identify with both the tortoise and the hare having my own experience with racing, not on foot, but rowing in a boat. And like all of us, I have had a lot of experience with carbohydrates and protein. In high school I munched throughout the day from baggies filled with crunchy Cheerios and peanut M&Ms. After school I always ate pure protein, a piece of cold salmon or roasted turkey as I changed in the car on the way to practice, moving back into the front seat at the same stop sign every drive. I was ready to row by the time I reached the dock in my spandex with my hair tied in a pony tucked under my lucky baseball hat that I still wear today. After practice I would eat something warm and toasty on the way home in the car like pizza or cheeseburgers. Only to crash like the hare causing countless blurs of homework filled all-nighters. It was more of the same in college craving carbs and coffee all day, throughout the day especially after my 5am practice. It felt good to be out in the quiet cold. But by seven I would be back on campus shivering and wet in the dining hall with the rest of the team giving in to my favorite French Toast and a steamy cup of hot coffee mixed with cocoa. It didn’t help that my roommates were still asleep when I returned to my dorm room. I would crawl back to bed intent on a twenty-minute power nap but would fall into carbohydrate comas despite set alarms just like the hare. For races I am more disciplined eating only cold grilled chicken. A quick protein will not sit in my stomach making me sluggish by race time like the tortoise. I carefully stay away from complex carbohydrates like donuts before heats because I do not want to jeopardize my performance to crash and burn like the hare. And most important of all, I hydrate with electrolytes from Gatorade or PowerAde and lots of water, a resource that both the tortoise and the hare maybe didn’t have or think about. In rowing you exert yourself beyond what you know is possible because at the finish line tenths of seconds count. 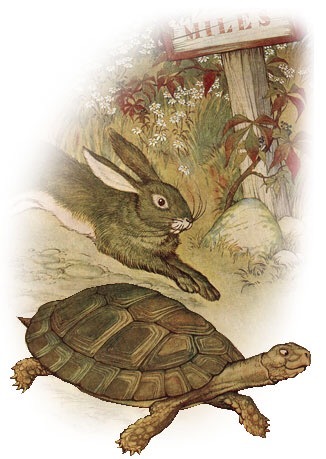 Be ready for a race and life’s long haul heeding the importance of the tortoise and the hare. My baggie of Cheerios and Peanut M&Ms were a nice try as Cheerios are made from oats direct from the hare’s diet but the sugar from the M&Ms is an empty stretch comparison to the nutritional value in carrots. Even better would be to forget the candy shell altogether. The chocolate has antioxidants but plain roasted peanuts would be better. While the tortoise may never have eaten a legume, the peanuts pack protein. The smarter option would be to eat smaller meals throughout the day. Colorful veggies, nuts, a multigrain dressed in a little EVOO and maybe some lean salmon or chicken combine the best from both diets to net the best results. Then again, has anyone ever wondered about why the Big Bad Wolf is so moody? Does he need to be on a gluten free diet?